After looking at the Islanders dynasty of the 80’s, we’re going to jump back in time just a few years to look at the dynasty that preceded them. Our #4 team is from that dynasty and it featured some of the greatest forwards, defensemen, goalies, and coaches at the pinnacle of their careers. When you have every part running at its highest level of efficiency, you end up with a machine, which is exactly what the 1977-1978 Montreal Canadiens were. The 1976-1977 season was a work of art and probably one of the greatest regular seasons in all of sports. 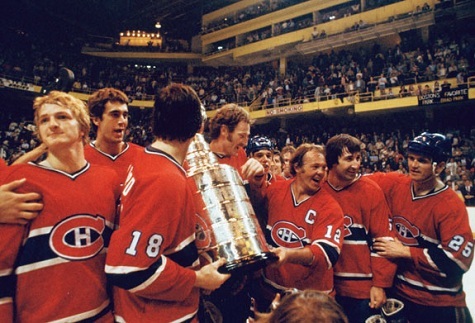 The Canadiens went 60-8-12 for an NHL record 132 points and won their 2nd consecutive Stanley Cup with relative ease, sweeping two of their 3 playoff series including the Finals. Essentially the Canadiens were looking to just keep the machine oiled and rolling. The Canadiens were led by their outstanding top line of Guy Lafleur, Steve Shutt, and Jacques Lemaire. Behind them, the Canadiens were still loaded, with Bob Gainey and captain Yvan Cournoyer. On defense, the Canadiens had the legendary Larry Robinson and Serge Savard as well as Guy Lapointe. In goal was Ken Dryden – no further explanation needed of his greatness. And to top it all off, these Canadiens were coached by Scotty Bowman, arguably the greatest coach of all time. Let’s just head to the season recap. The season started off as expected. as it took 9 games before the Canadiens finally got beat in the regular season. At the end of the first month, the Canadiens were sitting at 6-2-2. November saw the Canadiens ramp up their game even more and make a big trade by sending Pete Mahovlich to the Penguins in exchange for Pierre Larouche who was a couple of seasons removed from a 53 goal 111 point campaign. By the end of November, the Canadiens were 15-4-3. It’s hard to make a lot of remarkable comments about the Canadiens regular season because it was just so routine and effortless. Of their 15 wins thus far, only one was a one goal game. Among those 15 wins were a 7-3 win against Minnesota, a 2-0 win against the 1977 Stanley Cup runner up Boston Bruins, and a 9-1 win vs Pittsburgh. In fact, in the first 22 games of the regular season, the Canadiens gave up an average of 1.91 goals a game, scored an average of 3.86 goals a game and were in cruise control. The Canadiens muddled their way through the next two and a half weeks going 4-3-1 in what was one of the roughest stretches of the Canadiens season. However, the Canadiens dug deep and went on one of the greatest runs in NHL history. After their December 17th 6-3 loss to the Penguins, the Canadiens went on a 28 game unbeaten streak, going 23-0-5 and putting some serious distance between them and the rest of the league. At the time of their December 17th loss, the Canadiens were 19-7-4 which was nothing special. After their run, on February 25th, the Canadiens were 42-7-9. That’s unreal. For more than 2 months, the Canadiens did not lose a game. 70 days. For 70 days, the Canadiens were not defeated. Their wins were pretty spectacular too. Only 2 of those 23 wins were by 1 goal. 11 were by 3 goals or more. 17 of the games had the Canadiens score 5 or more goals. It was truly a spectacular run. After that, the Canadiens had 22 games remaining and went a not too shabby 17-3-2 to close their season out at 59-10-11 for 129 points, the 3rd best regular season mark of all time (76-77 Canadiens, 95-96 Red Wings). That last run included another 15 game unbeaten stretch (13-0-2) that included a highlight 7-1 win over the Boston Bruins. The Canadiens won their division by an insane 51 points and finished first overall in the NHL by 16 points. Guy Lafleur won the Hart Trophy and the Art Ross Trophy for the 2nd consecutive year, finishing the season with 60 goals and 132 points. Ken Dryden finished the season 37-7-7 with a 2.05 GAA and won the Vezina Trophy. Bob Gainey won the Selke Trophy. The Canadiens essentially monopolized all the NHL awards. If the Rocket Richard trophy had been around, Lafleur would have won it. If the Jennings Award was around, the Canadiens would have had that too. This was truly one of the most dominant seasons in NHL history and it included several dominant individual seasons. Going back to the Canadiens top line, affectionately known as “The Dynasty Line”, Lafleur had 60 goals and 132 points, Shutt scored 49 goals (3rd in the NHL), and Lemaire finished with 97 points (4th in the NHL). As a team, the Canadiens weren’t too shabby. They led the league in goals for (4.49), goals against (2.29), powerplay percentage (31.9% – not a typo), and even strength for/against (1.95). Insane. Enough of the dominance there, let’s look at their dominance in the playoffs. In the first round, the Canadiens met up with their divisional rival, the Detroit Red Wings. The regular season ended with the Wings shutting out the Canadiens 4-0. Unfortunately for the Wings, that was their best result against the Canadiens. The Canadiens had thrashed them in the regular season, winning games 6-1, 9-3. and 5-1 en route to owning a 4-1-1 season series edge. The Wings were hoping that they would get lucky, but unfortunately the Canadiens were a machine that didn’t believe in emotions – just destroying everything in their path. Game 1 was a 6-2 thrashing. The Wings managed to steal Game 2 in Montreal, putting a bit of a scare into the Montreal fans. However, Montreal quickly squashed all those negative thoughts, outscoring the Wings 16-4 in the final 3 games of the series. For the series, the Canadiens outscored the Wings 24-10 and turned the series into a laugher. Awaiting the Canadiens in round 2 were the Toronto Maple Leafs. The Canadiens and Leafs met 5 times in the regular season, with the Canadiens going 4-0-1. Their playoff series was absolutely no different. The series was a 4 game sweep, with the Canadiens absolutely demolishing the Leafs. In the 4 game sweep, the Canadiens outscored the Leafs, 16-6, with the highlight being a Game 3 6-1 thumping in Toronto. The Leafs were no slouch either, as they were led by their trio of Hall of Famers, Darryl Sittler, Borje Salming, and Lanny McDonald. In the regular season, the trio combined for 108 goals, 172 assists, and 280 points in the regular season. However, they just had no room to operate against the machine-like Canadiens. After disposing of the Leafs, the Canadiens were back in the Stanley Cup Finals and their opponent was Don Cherry’s “Lunch Pail Athletic Club”, better known as the Boston Bruins. The Bruins were the 2nd best team in the regular season, finishing 51-18-11 for 113 points. In years past, the Bruins were led by Bobby Orr and Phil Esposito, but didn’t have as much depth scoring behind the two. However this year, the Bruins had an NHL record 11 players score 20 or more goals. They had 10 players with 50 or more points. This was one of the most balanced scoring teams in NHL history. However, even the Bruins couldn’t solve the Canadiens in the regular season, losing the season series 4-0-1. The Bruins also had to deal with the painful memory of being swept by the Canadiens in the Finals last year in humiliating fashion, managing to score only 6 goals in the 4 games. This time though, they were ready to put up a fight. Boston had cruised into the Finals, dropping just 1 game, like the Canadiens. Game 1 was going to be a showdown. However, Guy Lafleur and Larry Robinson did their best to make sure that this series swung in the Canadiens way. Game 1 was all about “The Flower” as he recorded 3 points to lead the Canadiens to a 4-1 victory. Game 2 was a much tighter game as the Bruins were able to push the Canadiens into overtime. However, “The Flower” and Larry Robinson struck again. Robinson took the puck from behind his net and stormed up the ice, finding Lafleur streaking down the right boards. Robinson hit him with the pass and Lafleur scored on a wicked slapshot with 7 minutes to go in the first overtime to give the Canadiens a 2-0 series lead heading back to Boston. The Bruins knew that Game 3 was the do-or-die game. Lose, and chances are they would be swept just like the previous year. Win, and they are right back in the series. Boston did just that and more. The Bruins stormed out in Game 3 and took control, eventually cruising to a 4-0 win. Game 4 was another hotly contested game as it went into OT locked in a 3-3 tie. This time though, it was Boston’s Bobby Schmautz that ended the game, beating Ken Dryden with a sharp wrister from the slot, knotting the series at 2 heading back to Montreal. Game 5 was the huge game of the series and afterwards, Bruins coach Don Cherry would admit that one play changed that game. The Bruins knew that the first goal would be the key to the game as they needed to take the crowd out of the game and put the pressure on the Canadiens. The first 7 minutes were tightly contested before Larry Robinson decided to take it upon himself to break the tie. Robinson skated in to the offensive zone, beat both defenders before roofing a backhand over Boston’s Gerry Cheevers. After that play, the floodgates opened and Boston scored 3 more times in the next 33 minutes to take a 4-0 lead heading into the third. Boston would finally get on the board thanks to Don Marcotte’s 5th of the playoffs, but it wasn’t enough. Montreal took Game 5, and heading back to Game 6, everyone in Boston’s locker room had a feeling of the inevitable. In Game 6, the Bruins actually did open the scoring, scoring just 4 minutes in to the game. However, Steve Shutt answered just 3 minutes later, followed by Mario Tremblay another 2 minutes later. Montreal led 2-1 after the first period and Tremblay decided to make life more miserable for the Bruins. Tremblay scored his second of the game with 6 minutes remaining in the 2nd to stretch the lead to 3-1. Rejean Houle tallied for the Canadiens 4 minutes later and the rout was on. The Canadiens just held serve in the 3rd to win the game 4-1, win the series 4-2, and win their 3rd consecutive Stanley Cup. So that’s the story of the 1977-1978 Montreal Canadiens. But what made this team so special? We already touched on their offensive diversity with the Dynasty Line, the leadership of Yvan Cournoyer, the brilliance of Larry Robinson, and the legendary goalkeeping of Ken Dryden. What more is there to say? This team dominated offensively, dominated defensively, had a 28 game unbeaten streak and was coached by the greatest coach of all time. They featured so many legendary players in their prime. I guess the signature of this team was their ability to always conjure up the big play whenever they needed to. They always struck big when they needed to, seized the moment when it was there for the taking, and always knew when to kick it into the next gear. That’s why they are the #4 team of all time.